It is Heineken Cup sudden death time with four French and two clubs from each of England and Ireland left in the hunt for the title of the 16th champions of Europe. Five of the last eight – defending champions Toulouse, Leicester Tigers, Leinster, Northampton Saints and Ulster Rugby – already have their names etched onto the silverware with the French trio of Biarritz Olympique, Perpignan and tournament debutants Toulon bidding to join them. The route to the final at the Millennium Stadium on Saturday, 21 May, is clearly mapped out for all the clubs with either Leinster or Leicester Tigers from the Dublin quarter-final and either Northampton Saints or Ulster Rugby from the Milton Keyes encounter enjoying home advantage in the semi-finals three weeks later. The Saints are the only one of the quarter-finalists to take an unbeaten record through from the Pool stages, and now face Ulster at Stadium MK, 2pm on Sunday, and Director of Rugby Jim Mallinder declared: “We are going into the game in a positive frame of mind. “We’ve played reasonably well over the past few weeks, got some good results home and away and everyone in the squad has put their hand up for selection. We’re certainly going to have a tough time choosing the team for this weekend’s game. “But of course there are things to work on and we’ll be looking to improve in all areas ahead of what is a challenging game against Ulster this Sunday. “Getting good results in the Premiership is one thing, but the Heineken Cup is a massive step up in intensity and physicality, especially when you get to the knock-out stages. “We found that out last season and hopefully we can learn from that experience this year. We are a young team that is still developing and this weekend’s game is a good yardstick for us. “Ulster have been on a good run of form recently and are going really well in the Magners League. They have shown repeatedly that they know how to win tight games, not just in the Magners League but in the Heineken Cup as well, especially with their win at Bath. “Ulster have a pair of quality half-backs in Ruan Pienaar and Ian Humphreys, and they have excellent players throughout their squad. We will certainly have a tough job on our hands if we are to get a positive result on Sunday. We will need to keep our shape in defence, keep our discipline and take our opportunities in attack. “We’re looking forward to the occasion, which will be massive for the club, and especially our supporters. The Heineken Cup quarter-final at Thomond Park last season showed the value of having a large and vocal crowd behind you and we want to make the home advantage count. Johnny Bell won’t let sentiment get in the way of his determination to steer Ulster Rugby into their first Heineken Cup semi-final in 12 years when they travel to his old stamping ground this weekend. The former Ireland centre spent three seasons playing for Northampton Saints before making a timely return to Belfast in 1998 and helping Ulster Rugby to win the Heineken Cup. These days the Man of the Match from that epic 21-6 triumph over Colomiers at a packed Lansdowne Road is the Elite Player Development Officer at Ulster and will play a big part in the build up to the clash at stadium:mk. Bell played with Paul Grayson, who is on the Saints coaching contingent, during his time at Franklin’s Gardens and pipped his old team-mate to a coveted Heineken Cup winners’ medal by one season. “I loved my time at Northampton. 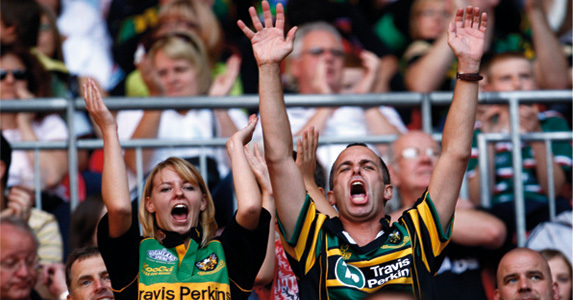 It is a real rugby town and Franklin’s Gardens is an unbelievable ground,” said the 36-times capped Bell. “The form they showed during the Heineken Cup was very, very good and, even though they had a bit of a slump during the 6 Nations, now they have got their quality players back they have become a different animal. “It is going to be a massive task to go there and win and we know we will travel as massive underdogs. Reaching the quarter-finals has been a big, big step for us, but we can’t settle for that. “We know that any of the other teams in the last eight would have been happy to have drawn us, so we have got to go to Milton Keynes and get a good performance out of our side. If we play very, very well I’m confident that we stand a good chance of beating them. “If we were having to go to France and win it might be different. But stadium:mk is a pretty neutral venue and everything is there for us to play for. “At this stage of the season in the past we have been involved in dead rubber matches, but this season we are in the Heineken Cup quarter-finals and are involved in the business end of the Magners League campaign. Both Bell and Director of Rugby David Humphreys provide direct links from the current Ulster squad to the team that became the first Irish province to be crowned champions of Europe back in 1999 and they hope to use their experience as inspiration to combine with the professionalism of their South African contingent. With Ireland’s 2009 British & Irish Lion Stephen Ferris ruled out after undergoing surgery, it will be the likes of Super 14 winner Pedrie Wannenburg, Springbok Lions slayer Ruan Pienaar and South African internationals BJ Botha and Johann Muller. “It is a big blow not having Stephen Ferris, but we certainly have more depth in our squad this season. The South Africans have been brilliant both on and off the field and they have introduced belief, professionalism and a great attitude at the club,” he added.